The stakeholder approach to sustainability indicator development has led to a plethora of different indicator sets. This makes cross-comparisons difficult and is inefficient in terms of resources that need to be spent on measurement and reporting. Furthermore, important aspects of sustainability may be omitted, either because there is no particular stakeholder interest that defends a specific aspect, or due to concerns for data availability. An alternative to the stakeholder approach is a more conceptual approach (these approaches are of course not necessarily mutually exclusive) starting from the definition of sustainable development and which in its outset seek complete coverage of what the UNEP/SETAC Working Group on Impact Assessment (Jolliet et al. 2003) called “areas of protection”. A conceptually complete organisation of “areas of protection” can be seen in Table 1. What I mean by conceptually complete is that any item must be either human or non-human; any non-human item must be either biotic or non-biotic; any value must be either intrinsic or instrumental. Table 1. Areas of protection in the SETAC/UNEP LCIA framework from Jolliet et al. (2003) slightly modified by Weidema (2006). 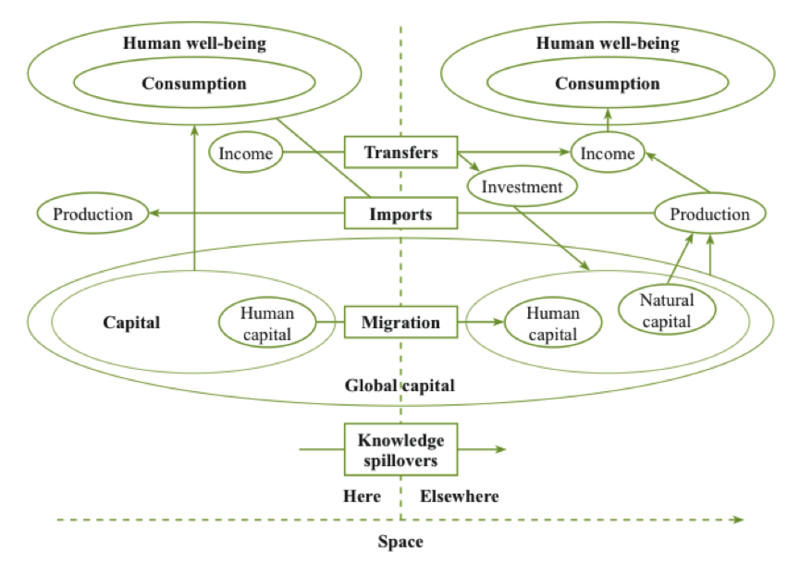 You may note that what is here called “Instrumental values”, may also be called “Resources” or “Capital”, and that both human and man-made ecosystems/resources are covered, without necessarily making an explicit distinction (which of course could be done at a next level). While such a framework provides completeness, it is of course only the first step towards a complete set of indicators. Another recent important contribution in this field, which also has a conceptual starting point, is the Conference of European Statisticians Recommendations on Measuring Sustainable Development (UNECE 2014). In this report, you can find not only a very comprehensive set of sustainability indicators but also a very clear description of the relationship between these indicators and the national accounting framework. The report particularly points out that for each aspect to be measured, both a geographical (imports/exports) and a temporal (capital transfer to future generations) perspective need to be covered. I reproduce below the graph that illustrate the geographical perspective. 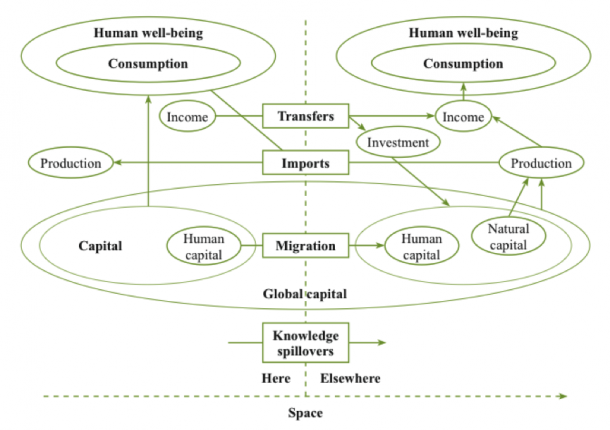 Figure on Sustainable development: “here” versus “elsewhere”. From UNECE (2014). The recommendations have been endorsed by statisticians from more than 50 countries and are expected to contribute to the ongoing United Nations processes for setting up Sustainable Development Goals and the related targets and indicators, and defining a post-2015 development agenda. The conceptual foundation and the potential indicators suggested in the UNECE publication may serve as a good starting point for further harmonization of the measurement systems and development of a set of indicators that could be used for comparison across countries, and probably with some adaptation also across individual enterprises and products.